The Alaska Notice of Termination of Month-to-Month Tenancy fulfills a requirement of the Alaska Landlord and Tenant Act when one party wishes to end a month-to-month tenancy. 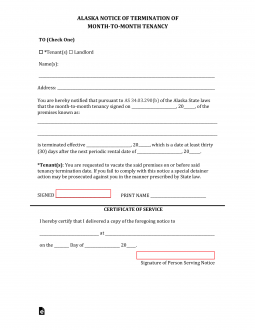 An Alaska Month-to-Month lease affords a balance between security and freedom for the landlord and tenant so quite a few landlords and tenants enter a month-to-month lease however while the decision to terminate may be at the discretion of either party, thirty days’ notice must be issued (in writing) before actually doing so. That is, even with this type of lease arrangement a tenant can no more illegally abandon a leased space than a landlord may illegally evict a tenant. The thirty days’ notice requirement acts as a safeguard against either contingency. The notice, itself, is a simple straightforward form and should be delivered a month before the next rent is due. It should be noted there are exceptions to the thirty days’ notice requirement (i.e. a landlord allows a serious risk to health or safety condition to persist). However, generally speaking giving written notice is a wise legal precaution and operating within the confines of the law and the lease terms are mandatory in the state of Alaska. Step 1 – The top of the page will contain two checkboxes (Tenant and Landlord). Check the appropriate one. Please Note: If you are a landlord this is not an eviction. That is a separate action and providing proof this notice was served will be a very important part of an eviction procedure. Step 3 – Next to “Address,” write your full address. This is your contact information. Step 4 – The notification paragraph will require the month, day, and year entered. Enter the date the current date. Step 5 – Directly below the notification paragraph will be a space to list the address. Write the full address in this space. This is the address the month-to-month termination concerns. Step 6 – The next paragraph will require the date the termination occurs (the move out date). Enter the month, day, and year this is to occur. The next date in this paragraph is the beginning of the thirty days’ notice. Enter the month, day and year the notice is being served (this must be thirty days before the effective date). Step 7 – Sign your name and print it in the appropriate areas at the bottom of this section.